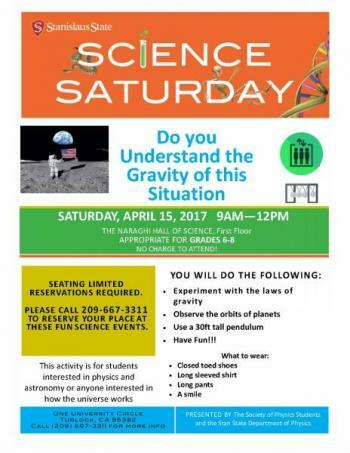 There is no charge to attend Science Saturday. 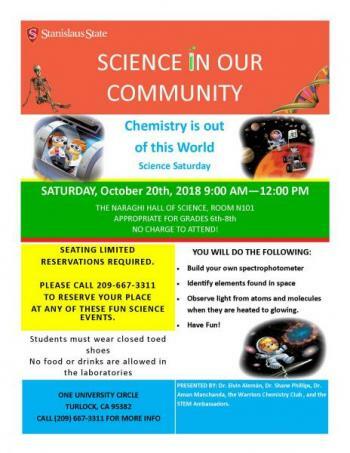 Seating is limited and RESERVATIONS ARE REQUIRED. 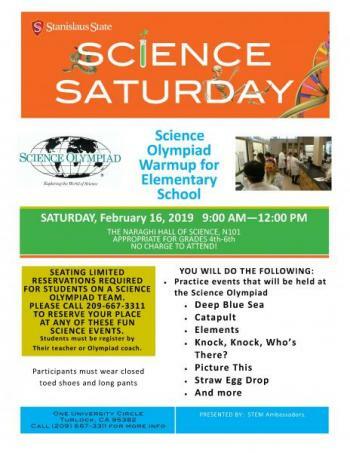 Please call 209-667-3311 to reserve your place at any of these fun science events. 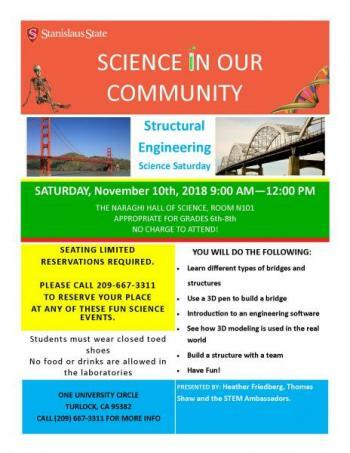 Presented by the Stan State STEM Ambassadors. Presented by Drs. 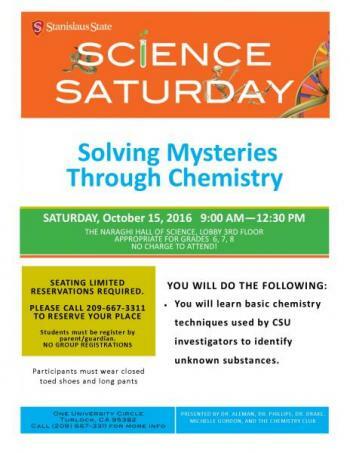 Koni Stone, Elvin Aleman, and Claudia Brackett and the Stan State Warriors Chemistry Club. 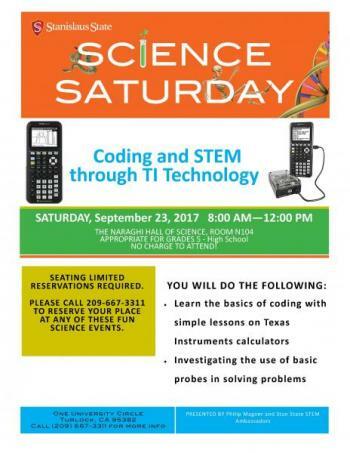 Presented by Heather Friedberg, Thomas Shaw, and the STEM Ambassadors. Presented by Drs. 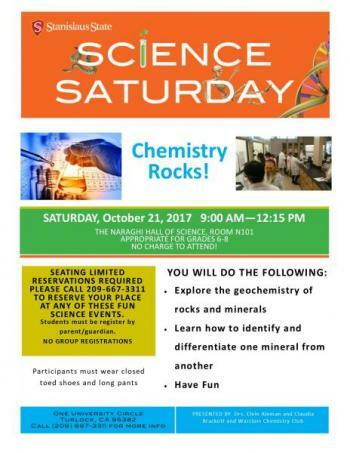 Aleman, Phillips, Manchanda, the Warriors Chemistry club and the STEM Ambassadors. Presented by Drs. Wing To, Leon Zhang, Brian Morsony, Alison Huff and the STEM Ambassadors. 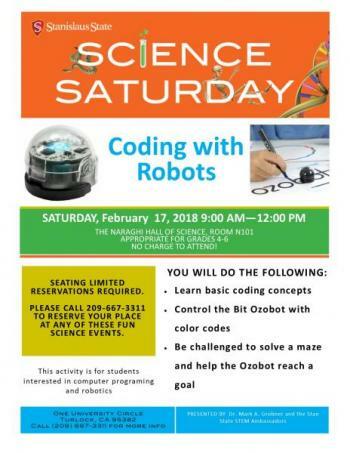 Presented by Dr. Mark A. Grobner and the STEM Ambassadors. Presented by Drs. Koni Stone and Elvin Aleman. You must be registered as a team through your school coach in order to participate. Presented by Dr. Wing To, Philip Rojas, and the Warrior Physics Club. 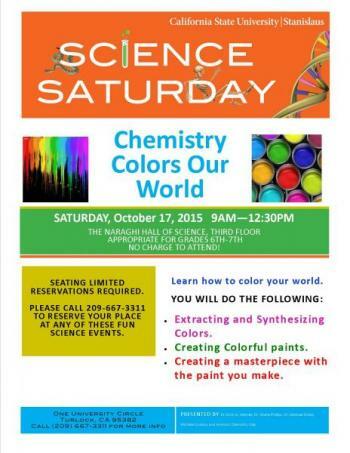 Presented by Dr.s Elvin Aleman and Claudia Brackett and the Warriors Chemistry Club. 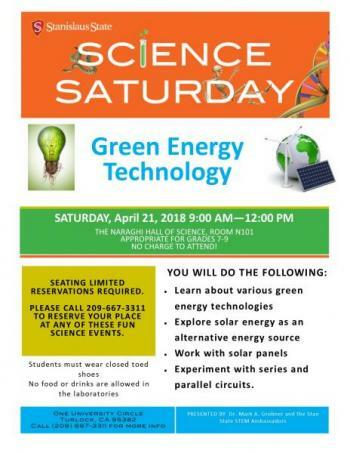 Presented by Philip Magner and the Stan State STEM Ambassadors. 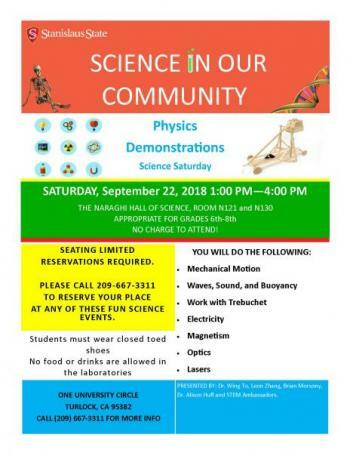 Presented by the Society of Physics Students and the Stan State Department of Physics. 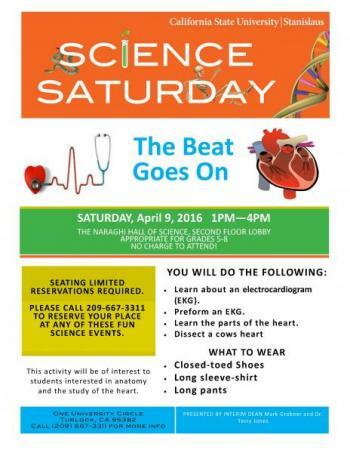 Learn about an electrocardiogram (EKG). Learn the parts of the heart. 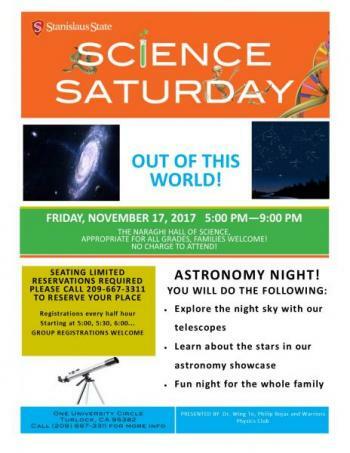 Presented by Dr. Mark Grobner and the STEM Ambassadors. 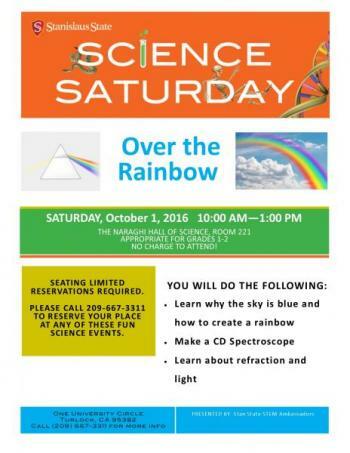 Learn why the sky is blue and how to create a rainbow. Learn about refraction and light. 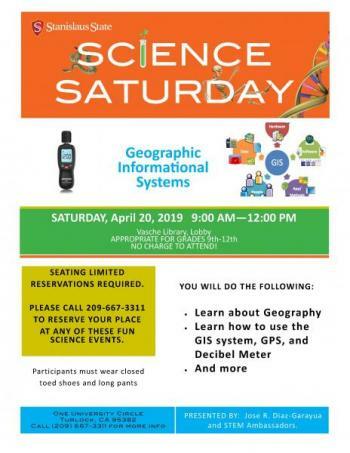 Presented by the STEM Ambassadors. Presented by: Drs. Aleman, Phillips and Drake, Michele Gordon and the Warriors Chemistry Club. Please arrive promptly by 9 am. Please be present for the full duration of activity. Participants must wear closed-toed shoes only. 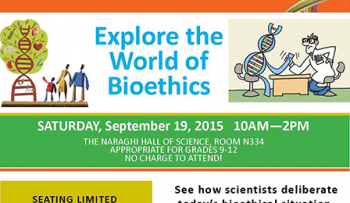 Presented by Dr. Terry Jones, Professor of Anatomy and Dr. Mark Grobner, Interim Dean, College of Science. Learn what your cells are made of. 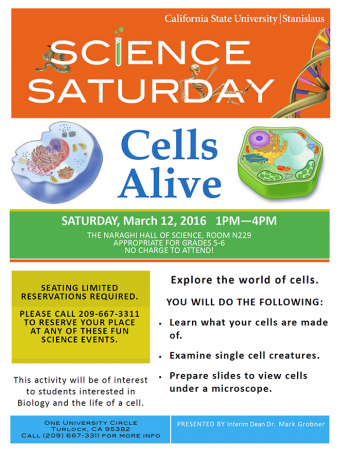 Prepare slides to view cells under a microscope. 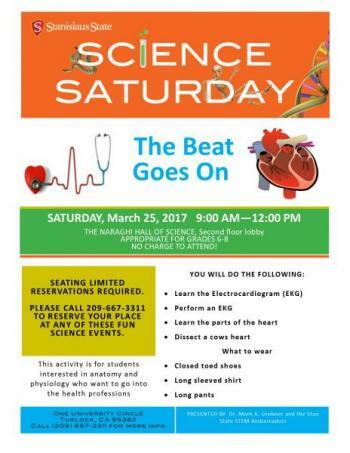 Presented by Dr. Mark Grobner, Interim Dean, College of Science. 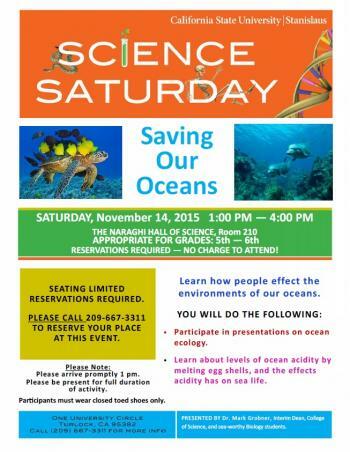 Participate in presentations on ocean ecology. Learn about levels of ocean acidity by melting eggshells and the effects acidity has on a sea life. 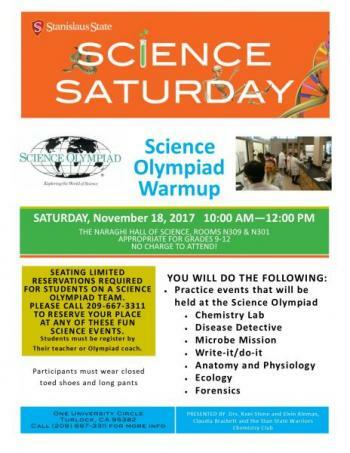 Presented by Dr. Mark Grobner, Interim Dean, College of Science and sea-worthy Biology students. Please arrive promptly at 1 pm.